Considering February is the shortest month, Mother Nature managed to fit in pretty much every weather type bar drought. 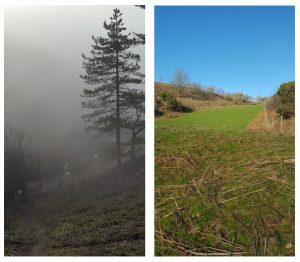 The choughs faced blinding fog, F10 gales, hailstorms, thunder, and glorious sunshine. Rolling sea fog to the west of Mourier Valley (left) glorious sunshine to the east at the same time. Photos by Liz Corry. This might explain why Lee and Caûvette failed to turn up for supplemental feeds four days in a row. In fact they were not sighted anywhere for almost five days. We are not entirely sure if they stayed out at Les Landes the whole time or just waited until sunset to reach their regular roost site at Sorel. Staff attempted to find the answer by stalking the pair around Les Landes and staking out the roost site. Both of which failed because they were either nowhere to be seen to stalk or the roost site was shrouded in fog. Just as panic set in with the sighting of peregrines hunting at Les Landes the pair were spotted. Both completely fine, behaving as normal feeding around the parade ring at the racecourse. There was the slight twinge of excitement about their absence if we went with the train of thought that they had chosen to roost at Les Landes. Would this be a clue about where they will attempt to nest? Choughs will nest in man-made structures and down mine shafts as well as sea caves and crevices. 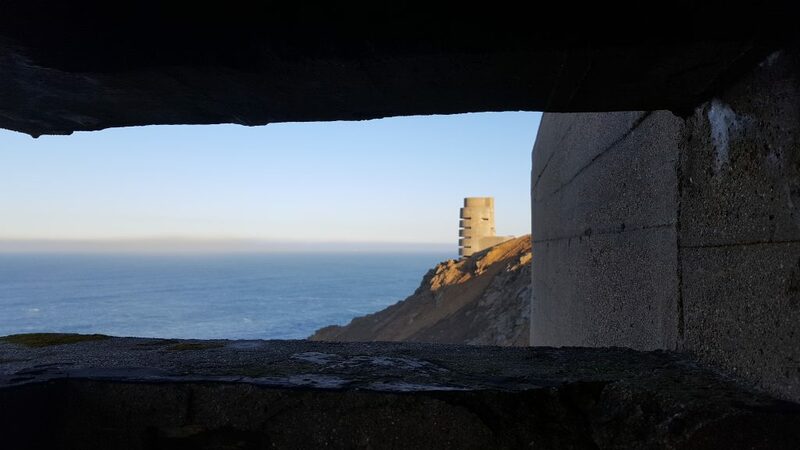 We know Jersey’s choughs have been hanging around the German observation tower at Les Landes so we decided to investigate the various structures built during the German Occupation in the 1940s. 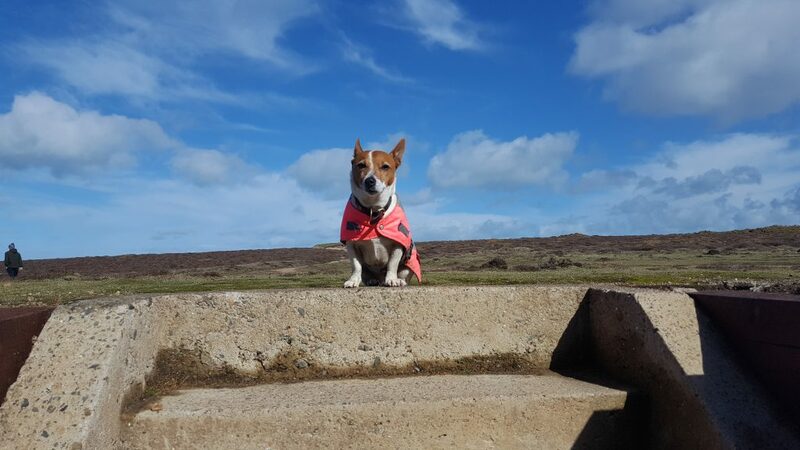 We met with Tony Pike from the Channel Island Occupation Society (CIOS) and his dog Sal who very kindly gave us a guided tour of the site. Tony Pike kindly allowed access to several German military structures to assess feasibility of chough’s nesting. Sal, his dog, was also keen to show us around as long as it wasn’t underground. Photo by Liz Corry. We started at the tower, known as the Kriegsmarine Marine Peilstand 3 tower. This was originally built by the German Navy for observing targets at sea. There are seven floors to it, five of which look out to sea and take a fierce battering from the sea winds. Birds cannot enter the tower from this side as the openings have been blocked off with perspex to preserve the interior. View of the MP3 tower at Les Landes. Photo by Liz Corry. There is one opening on the land side left open by CIOS members for bats to access if needed. Theoretically, the choughs can use this to access the tower. 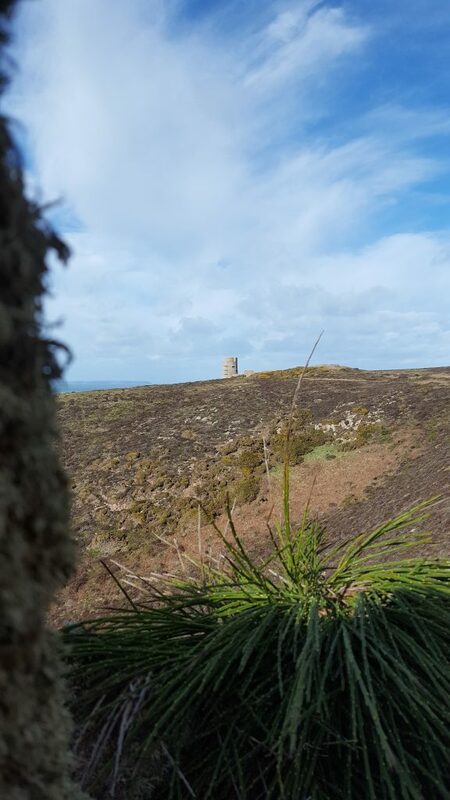 The walls of the tower are two metres thick providing a convenient shelter ledge for choughs at the opening. 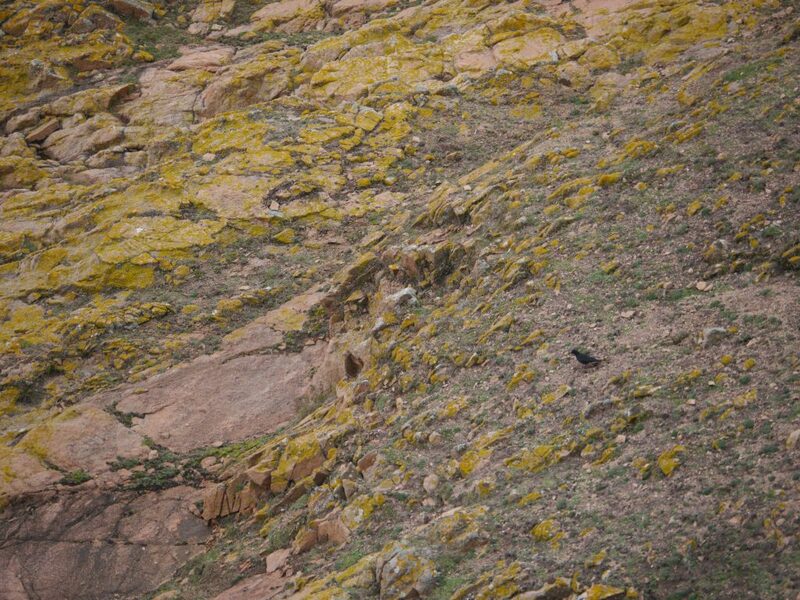 Despite the depth it might still be too exposed for choughs to choose to nest on. Once inside there are just flat walls, no ledges to build a nest on with the exception of the concrete spiral staircase. When it rains the floors can become very wet and although they dry out fast I imagine that a smart bird like a chough will quickly realise that this is not a suitable place to raise young. There are two ‘brother’ towers of Bt Steinbruch on Guernsey and Bt Annes on Alderney allowing the Germans to pass semaphore messages throughout the Channel Islands. The mobile network of its day. Maybe that is what the choughs are doing? Trying to scope out the other islands to decide whether its worth the flight across? Choughs practising semaphore in an attempt to communicate with Guernsey. Photo by Liz Corry. As a side note Tony pointed out two sites along the cliffs which the Germans had blasted square holes into the rock face to provide sheltered artillery positions for a soldier to sit in. This side note turned out to be extremely relevant as one is positioned a metre below where we have stationed ourselves several times in the past two months watching the choughs. If only we had known we could have saved ourselves a lot of earache and a few less head colds. 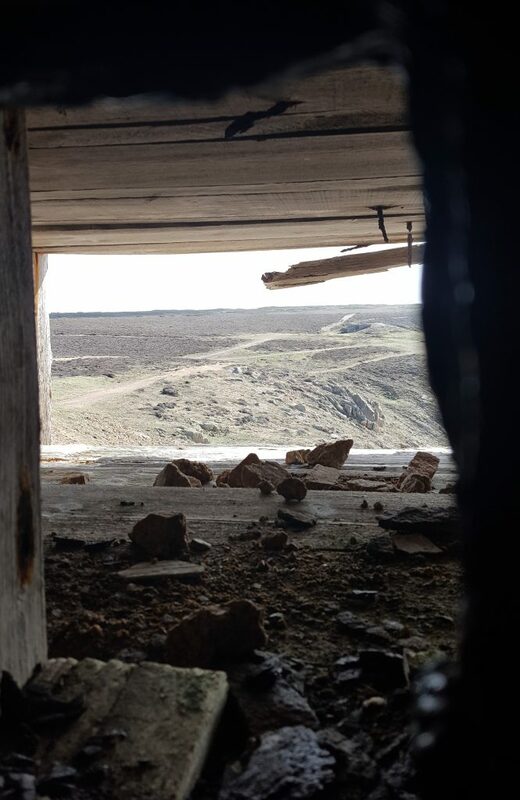 View from a rifleman’s lookout position blasted out of the cliff face. Photo by Liz Corry. A chough foraging on a cliff face the profile of which was changed when the Germans blasted rock and dumped rubble when building the bunkers. Photo by Liz Corry. The other structures we were interested in are to be found below ground. There is an extensive complex of passage-linked personnel and ammunition bunkers at Battery Moltke. Precision engineering by the Germans meant that the bunkers had heating and ventilation through a series of shafts and underground piping. None of which look accessible by choughs. 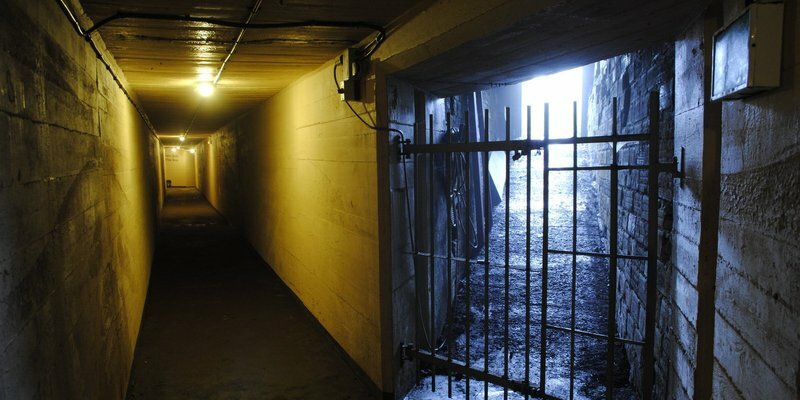 Most of the public entrance ways to the bunkers and passageways are behind locked metal-sheeted doors to stop vandalism. If the choughs did find their way in I would like to think they would appreciate what is hidden away underground as much as we did. One particular bunker was unearthed by Tony and a team of volunteers last year several decades after the States of Jersey had back-filled it with rubble for health and safety reasons. The ‘flower bunker’ as Tony called it, is an anti-aircraft bunker with a decontamination unit in case of a gas attack. 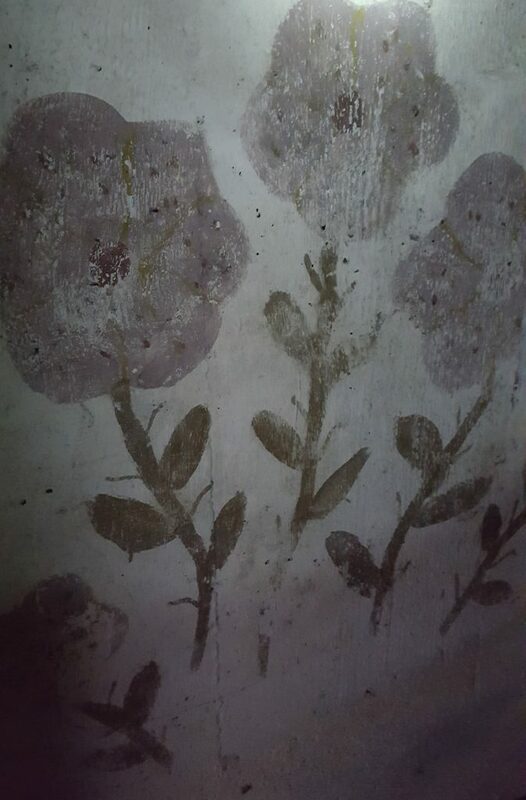 On the walls inside you can see the original artwork by German officers of flowers in what one assumes is an attempt to brighten up the doom and gloom one would face being locked away in an air raid. Original artwork by German officers on the walls of an anti-aircraft bunker at Les Landes. Photo by Liz Corry. From what we observed it looks unlikely that choughs would nest successfully in any of these places. We are very grateful to Tony nonetheless and now have a greater appreciation of Les Landes when we go out radio-tracking. The choughs still have the option of sea caves and crevices along that stretch of coastline. They may look to the farm buildings behind the racecourse. We will keep a close eye on Lee and Caûvette in March. At the first sign of twig carrying we will be on them like…falcons (in a non-aggressive way). Ronez Quarry very kindly agreed to fund nest cameras in the quarry this year. With help from quarry staff nest-boxes have been installed to try and encourage two particular pairs to nest away from active machinery. We cannot be sure that the pairs will use the boxes, but if they do we will be able to follow their progress closer than ever before. 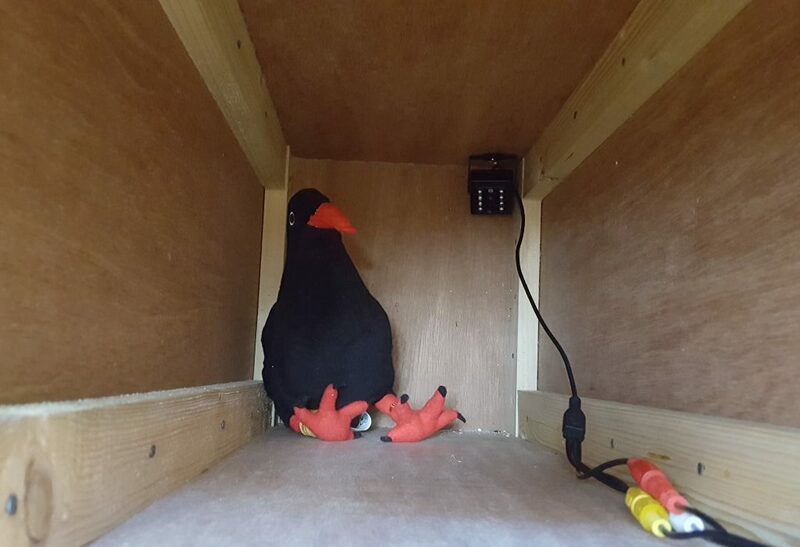 Using equipment supplied by Handykam we will be able to record what goes on inside the box and hopefully learn more about clutch size, hatch rates, and general day to day activities of nesting choughs. We do not currently have the option to view live footage. This incurs a greater cost and would be a gamble since we are not even sure if the birds will use the boxes. The set up also includes monitors at each site to allow quarry staff to check the nests whenever they like without disturbing the birds. 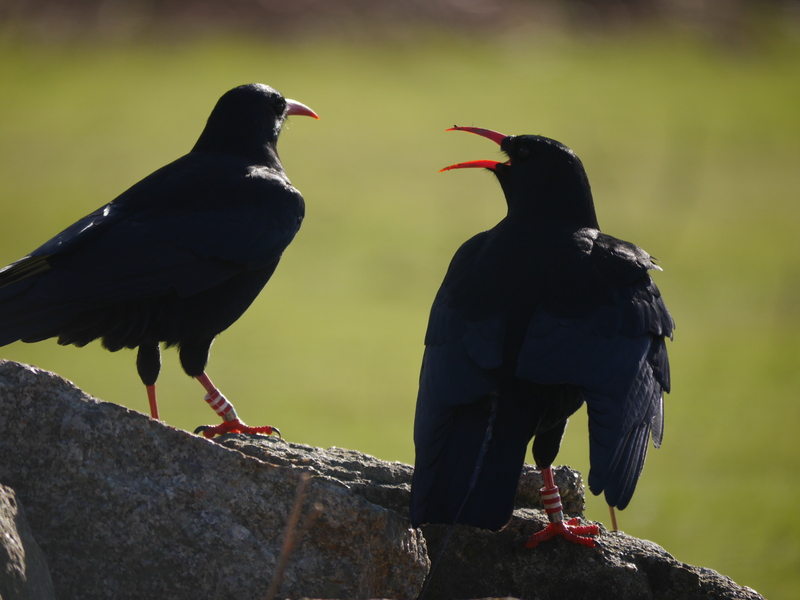 Their attentiveness over the past two breeding seasons has been invaluable to the success of the choughs. 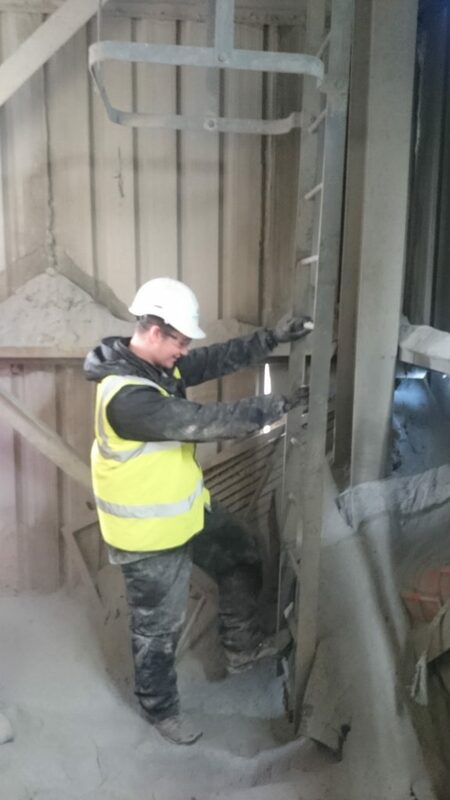 In the past we have had to wait for a scissor lift or something similar to be brought into the quarry to look in a nest if staff alert us to a situation. Now we just flick a switch. Highly sophisticated calibration techniques for setting up nest cameras. Photo by Liz Corry. If the pairs decide not to use the boxes we may be able to reposition the cameras and still capture nesting activities. 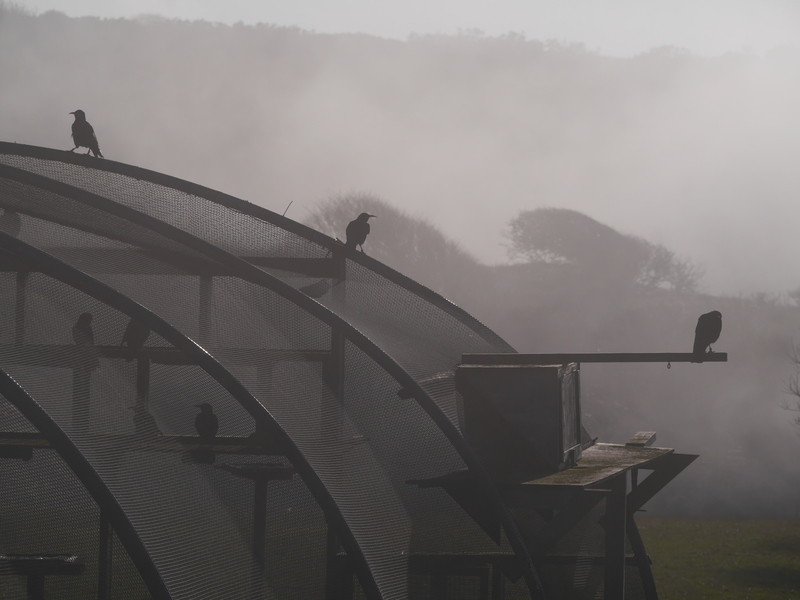 However, it all depends on timing as we do not want to disturb the choughs unnecessarily. We are very grateful to Ronez Quarry for funding and supporting this project. In particular Mark de Carteret and Andy Paranthoen for co-ordinating and fitting the cameras. Orlux Remiline granules, a complete food for song thrushes, is being gradually added to the supplemental diet this month. 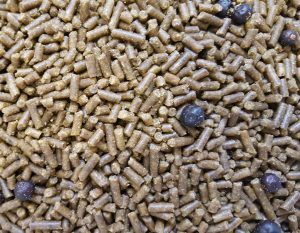 We are trying to see if we can switch from an egg-based diet which can spoil relatively quickly to a dry pelleted diet. If successful we will then look into automated feed stations similar to those used in Mauritius and New Zealand. Great report Liz – and brilliant to see Ronez so supportive of the project. Well done. Many thanks Nikki. 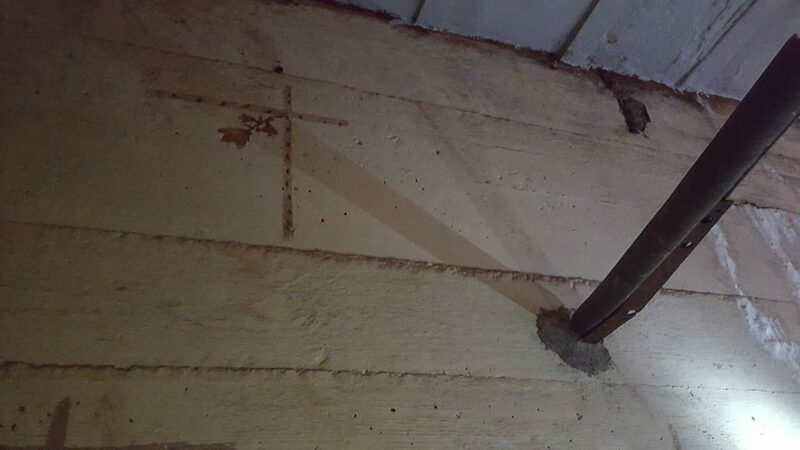 Considering that all the birds’ nesting attempts to date have been inside working industrial buildings we couldn’t have asked for more support from Ronez! Another fascinating report many thanks. Its so good to hear that a company such as Ronez are willing to help the environment . It gives us ” Hope”! Hi Liz, great report! 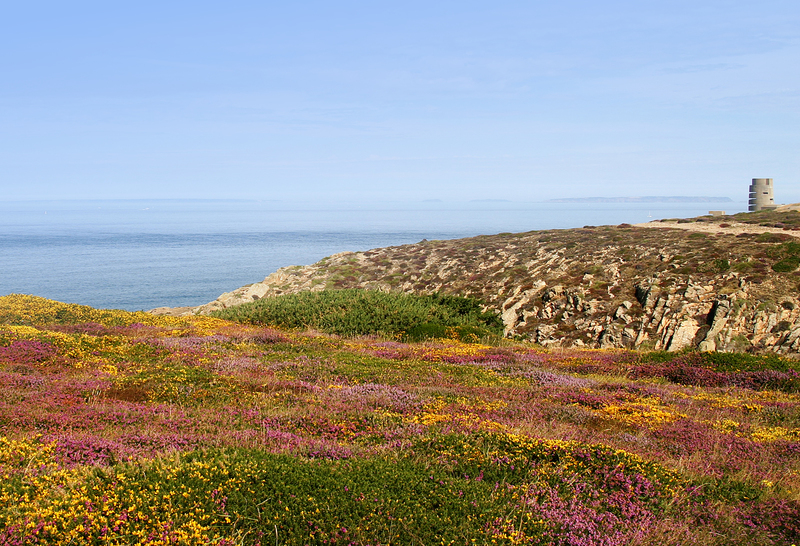 I have seen some Choughs at Les Landes yesterday and at Isle Agois on the north coast today . Thanks Liz, very interesting report! Good to work with my friends network in Brittany near us including at Cap Frehel near St Malo where wild Choughs visit from the 100 or so pairs nesting around Brittany. 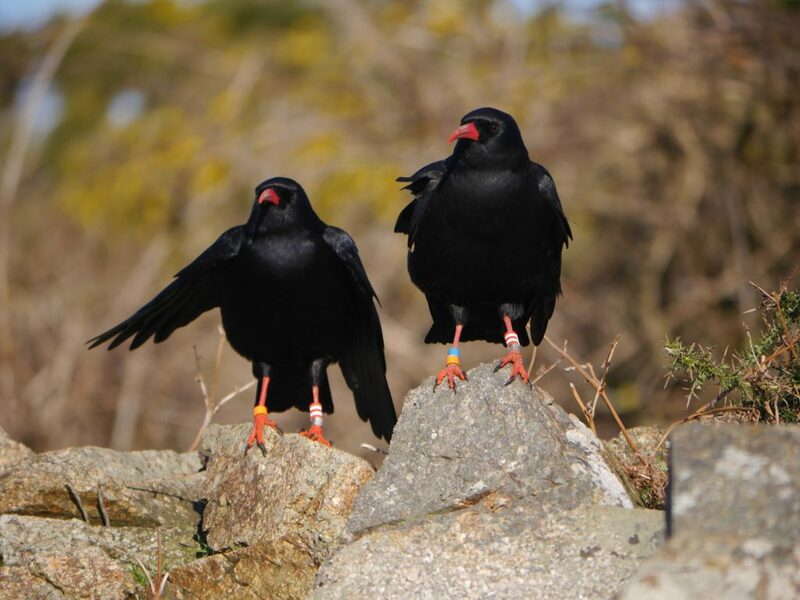 My friend Dr Kerbiriou in Brittany did post Doctorate research on the wild birds on the Britany mainland near us and does much colour ringing in the nest sites on the Brittany coast.so he could come and give us a talk on the big numbers of Red-billed Choughs nesting on the French mainland I study when I go over to St Malo with the LPO there. My friends study corvids in Brittany which visit us and use infrasound to hear corvids tens of kilometres away on the French coast. Infrasound is under 20 Hz under audible frequencies to hominids! Many thanks. We have, of course, consulted with Dr Kerbiriou from the very start of this project. Worth working with Bretagne Vivante and UPMC in Paris 6eme Universite de Pierre et Marie Curie 6 in Paris where Dr Christien Kerbiriou studies Choughs including a Red-billed Chough which turned up near the Somme estuary near Calais recently. They roam a good distance! Kind regards, B.Bree contact of 3,000 Bretagne-Vivante Chough conservationists in Britany near us.